Oil on canvas, 34 x 55 cm. This little painting is both a snapshot of a little slice of Danish coastline and a ceremonious image of something more universal. The few and simple iconographic effects contribute to the peaceful atmosphere. The composition appears bold and graphically tight with the select sunlit areas, a vast, calm sky and an unusually low horizon recalling Baroque landscapes from the 1600s. Meanwhile, the triangular composition with the small buildings and surrounding trees in the image’s centre create peace and harmony. The painting reveals careful observation of the visible world as well as an interest in less tangible phenomena such as light and atmosphere, which are depicted with a highly intuitive sensitivity. Købke was one of the Golden Age’s most sensitive landscape painters. 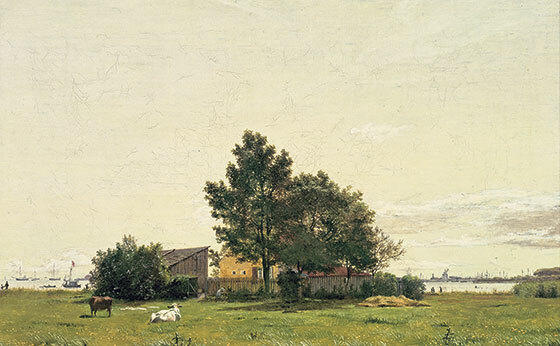 His father was head baker at the Copenhagen fortress, Kastellet, and throughout his life, Købke remained closely attached to his home and immediate surroundings, which also constituted the subject matter of his paintings. He was a student of C.W. Eckersberg, who greatly influenced his perception of subject and composition. As an artist, however, Købke was more directed by intuitive feeling than by principles, which is why he is described as pre-impressionistic in some art historical sources. Købke’s compositions are often boldly composed with an almost photographic cropping. He painted portraits and landscapes with a unique sense of colour and in his outdoor studies, he anticipated the kind of painting en plein air that would characterise Danish landscape painting later in the 1800s.